Implementation for the Google Cloud Platform APIs. 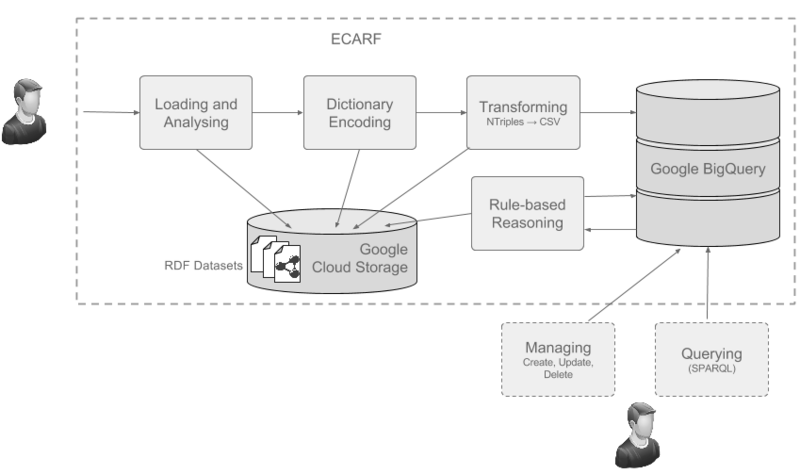 Pre-processing and analysis of RDF dataset files in Google Cloud Storage. Efficient dictionary encoding for RDF URIRefs. Loading of RDF datasets into Google BigQuery (Big Data columnar database). Forward rule-based reasoning using a subset of RDFS entailment rules (rdfs2, rdfs3, rdfs7 and rdfs9). The inference process uses some of BigQuery capabilities. Original and materialised triples are loaded into a BigQuery table ready for querying. Build SPARQL support on top of Google BigQuery SQL. Checkout the Getting Started section on GitHub. To find out more about ECARF, check out the documentation.